Queenstown is nestled on the shores of Lake Wakatipu, overlooked by the majestic Southern Alps and today is recognised internationally as New Zealand's premier visitor destination. 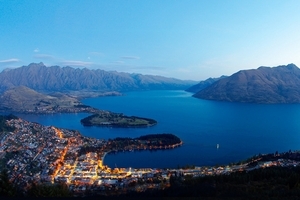 Queenstown is renowned for it's breathtaking scenery and diverse range of attractions and has a reputation as the adventure capital of the world. You can choose to join in or watch the massive selection of activities, there is something to test and thrill all adventure seekers. 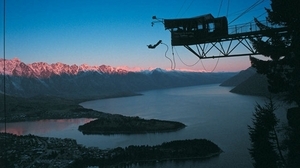 Bungy Jump from the world's first commercial bungy site, swoop and soar in your own controllable "rocket", whitewater raft, jet boat down canyons, hang mid-air below a parapente, hanglider or skydiver or simple abseil, the list is endless. 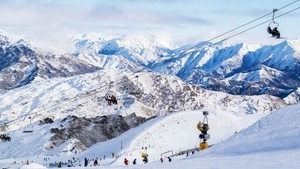 Visit Coronet Peak, the closest ski area to Queenstown and features New Zealand's best terrain which is wide and rolling. Exclusive Night Skiing July-Sept creates a total ski and apres ski experience. For full-on fun, go to The Remarkables, with natural sunny basins, great for the learner or expert. Dedicated Snow Tubing park, Kids Terrain which features a Magic Carpet lift. Join the Queenstown Wine Trail and discover award-winning wines from the World's most southern vineyards. Return to town and sample the delights on offer in the many shops, cafes and restaurants or lunch on a majestic steamboat. As night falls, get ready to experience the resort's buzzing nightlife. Where else in the world can you find mountains, lakes, rivers, forests, hiking trails and historic sites all within a short distance of each other. It's this compactness which makes Queenstown so attractive enabling visitors to do so much in such a short space of time. What ever your itinerary involves don't miss the opportunity to experience one of New Zealand's most vibrant and alluring destinations.